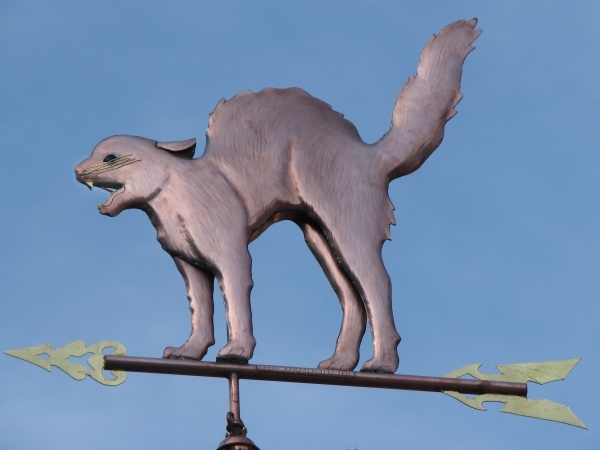 Our Scary Cat Weather Vane, affectionately called ‘Halloween’, makes a distinctive and unforgettable impression when viewed up on a rooftop. 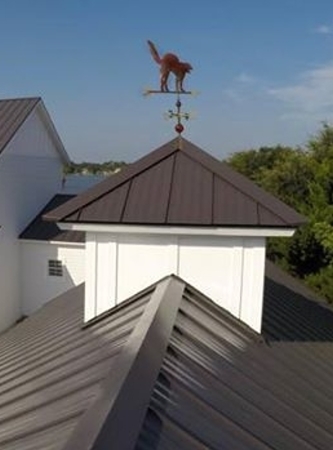 Using both mirror-image and swell-bodied construction, we wanted to capture the classic stance of that fierce and protective guardian of the home. 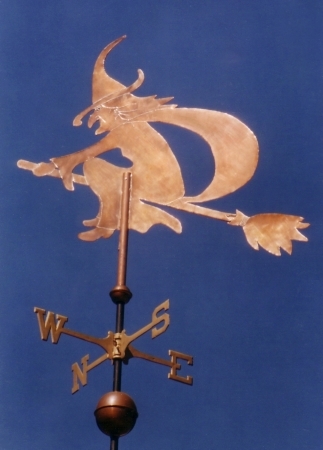 This weathervane is typically made in copper with translucent glass eyes, which are available in a variety of colors. 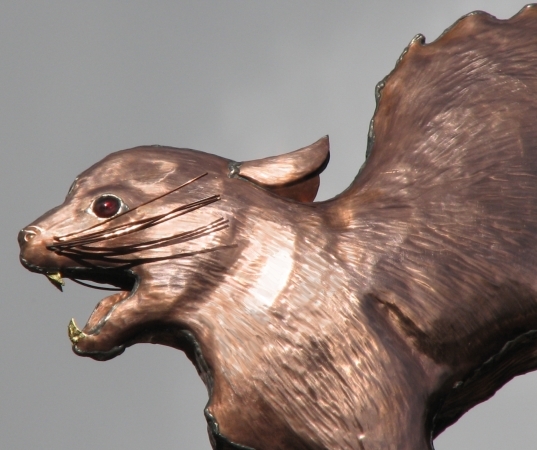 It can also be crafted with an optional collar and gold leafed teeth and whiskers. 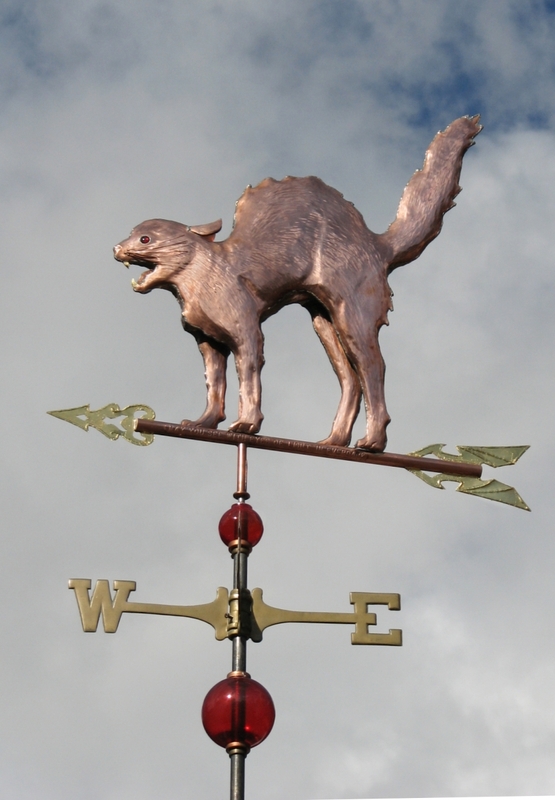 You can even provide photographs of your cat for a truly customized weather vane! 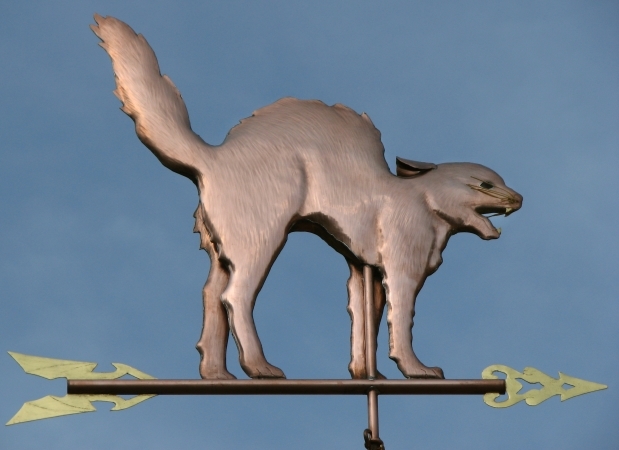 The Scary Cat Weather Vane shown here was made with optional gold leafed teeth and red translucent glass eyes. 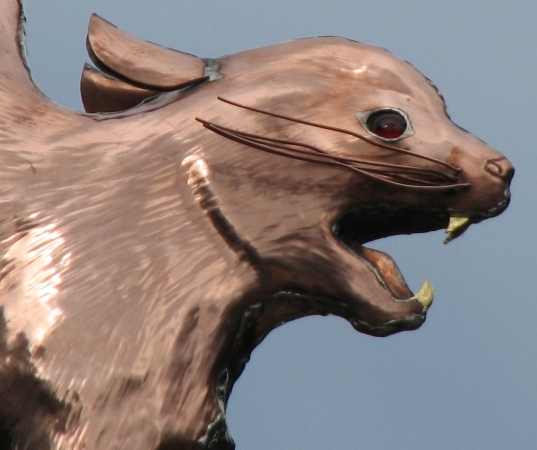 To complement the cat’s dramatic eyes, this particular customer selected optional red glass globes (also available in green or blue) instead of the more traditional copper globes. 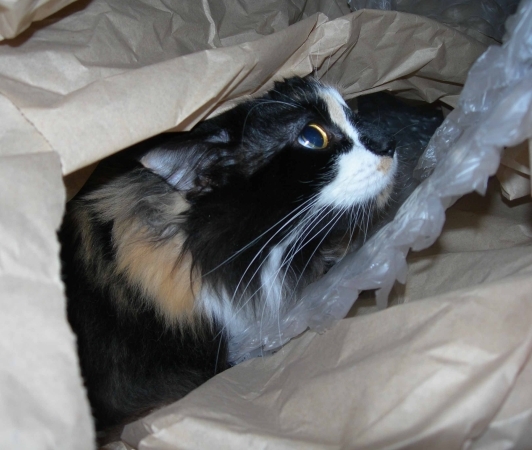 Optional glass globes are available in the medium, large and extra-large size. 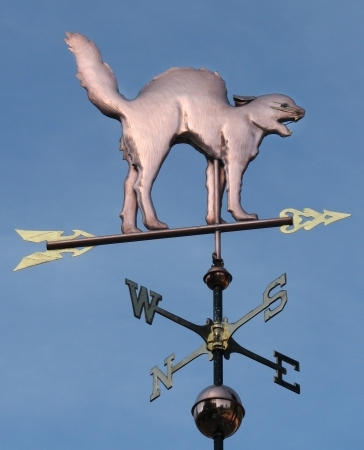 The little black and white feline pictured above is the ‘Not So Scary Cat’, Windsor, inspecting the package of his new weather vane. 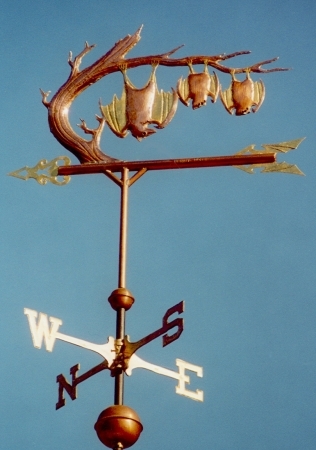 This weathervane is a classic example of a swell-bodied sculpture piece. 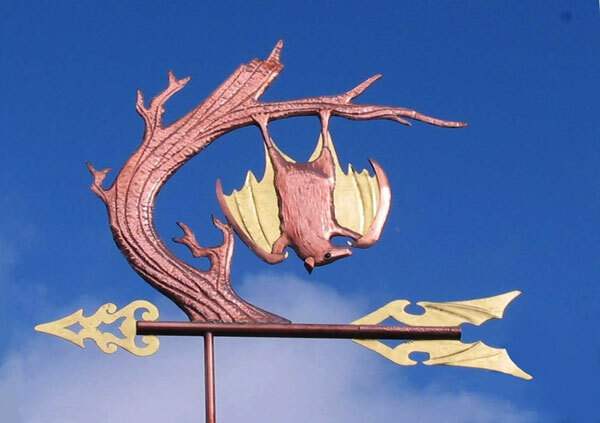 It has dimension, meaning it is made of two separate hand-shaped pieces of copper which are soldered together, leaving a hollow interior. 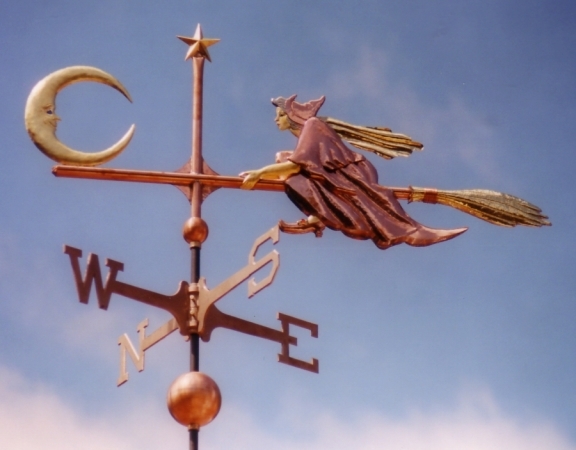 However, it is intentionally not made fully 3-D so it will be aerodynamic in the wind. 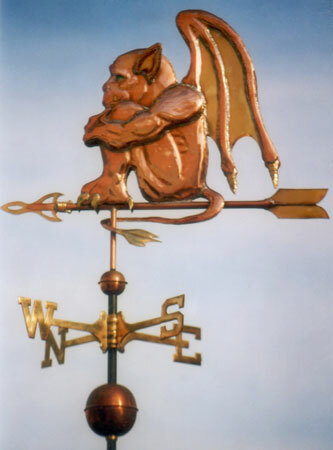 This is important as it is definitely one of those weathervanes you want to place atop a high prominent location for all to see. 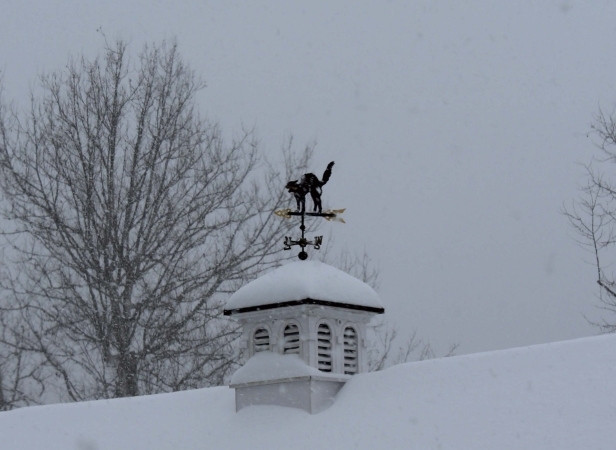 The weather outside is frightful but the scary cat is not afraid to challenge our first snowstorm of the season! 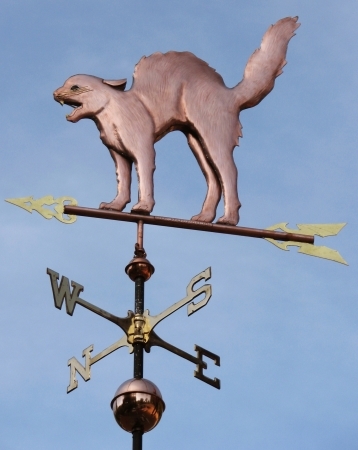 You might also be interested in another variation we offer of our Scary Cat Weathervane. 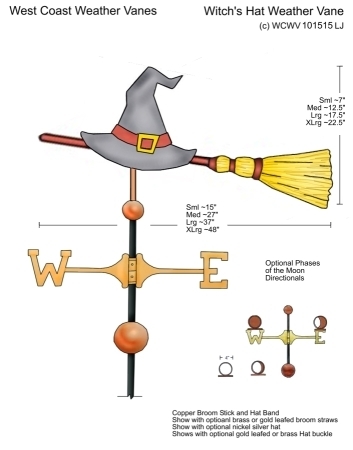 If you check out our Flying Witch Weathervane, you will notice this familiar figure zooming along just behind her flapping cape on the back of the broomstick. 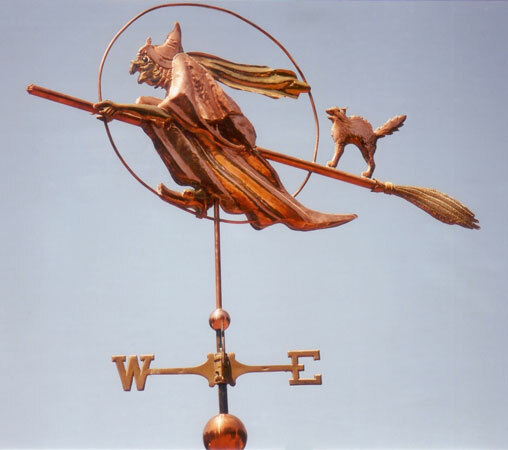 The scary cat and its association with witches has a long history. 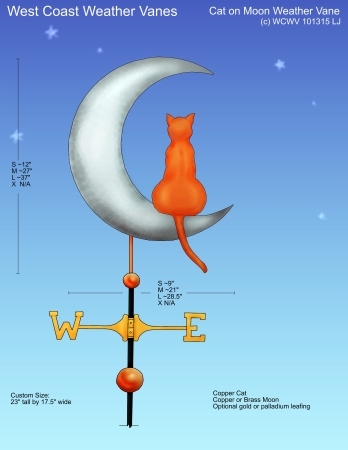 Probably one of the most famous witch’s cat is Crookshanks, the companion of Hermione, from the Harry Potter novels.